I've been thinking about ready positions recently. Conventionally, you aim your racket tip at the opponent, with the racket held midway between forehand and backhand. In theory, that's all you have to do. In reality, some players tend to hold their arm out to the side too much, and so are more ready for forehands than backhands. Try holding the racket more in front of you, even if it means bringing the playing elbow more out in front. However, there's another problem. Conventionally, the backhand is hit quicker off the bounce than the forehand. This means you have less time to hit the backhand. In many cases, this doesn't matter since the stroke is shorter. However, for some--including me--I find the backhand rushed and awkward when starting from a neutral position, while the forehand, where you have plenty of time to get the paddle into position as you turn sideways, is much easier. So years ago I adjusted my ready position so that the racket is in a slight backhand position, i.e. the backhand side of the blade partly faces the opponent. This gives me a head start on backhands, while I still have plenty of time to move the racket over for the forehand. I wonder if others have tried this out? I don't normally coach this, but I have advised some players who feel rushed on the backhand to experiment with this. In April, I ran an ITTF Coaching Seminar in Maryland, the first such seminar in the U.S. run by a U.S. coach. Fourteen coaches participated. After the seminar, to qualify for ITTF Coaching Certification, all coaches were required to do thirty hours of coaching (at least half group coaching), including five hours of "supervised" coaching with an ITTF coach or other approved coach. At this point, nine of them have now qualified: Carmencita "Camy" Alexandrescu, Changping Duan, Charlene Liu, Juan Ly, Dan Notestein, John Olsen, Jef Savage, Jeff Smart, and Vahid Mosaferi. You can see the listing for ITTF coaches here. If you set country to USA, then you can see the 26 ITTF coaches from the U.S. Congrats to all of them! Here's the article on the seminar by Jef Savage, including a group picture with names. I'm not much of a sentimental writer, but let's just say the Holocaust Museum was a sobering experience. I was there for two and a half hours on the self-guided chronological tour that roughly takes you from 1933 to 1945. 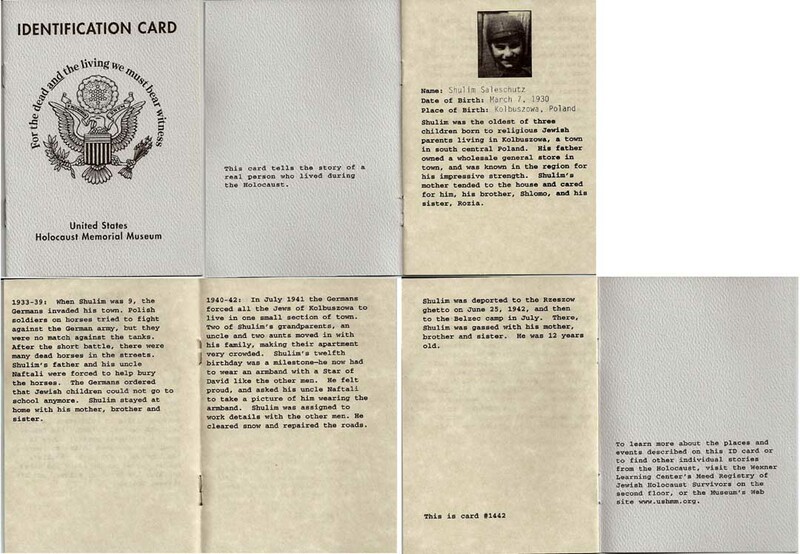 At the start, all visitors were given an "Identification Card," which was a short pamphlet about an actual Holocaust survivor or victim. Mine was of a kid named Shulim Saleschutz, born March 7, 1930 in Poland. It gives a picture of him and a short history of his life up to his getting sent to the Belzec camp in July of 1942. It ends with the words, "There, Shulim was gassed with his mother, brother and sister. He was 12 years old." Here's a scan I did of the pamphlet. From roughly 3-4 PM I walked over to the Washington Monument, the World War II Memorial, and the Lincoln Memorial. (The latter is huge, far larger than it appears in pictures.) It was in the mid-90s and sunny, so I wore my white 2005 Shanghai World Table Tennis Championships cap. 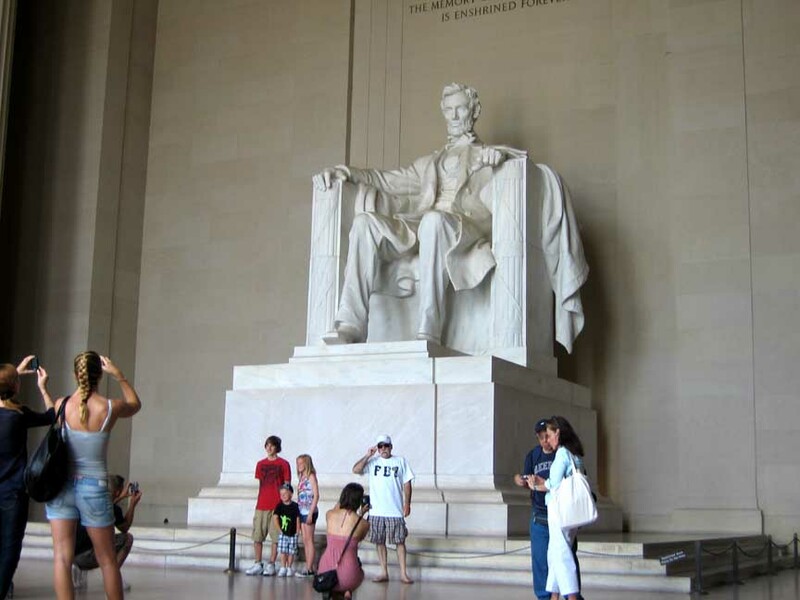 At the Lincoln Memorial, I sat on the floor against the wall for twenty minutes, looking up at Lincoln as crowds came and went. I couldn't help but think that he and I both faced similar problems - how best to serve, lots of killing, etc. Okay, his problems were a bit bigger. At the end, I thought about that John Tyler story I was writing, and suddenly the perfect way to open the story popped into my head. Thanks Abe! Here's a picture of Lincoln I took while sitting on the floor. From 4 to closing time at 5:30 PM, I visited the National History Museum - or rather, revisited, since I practically grew up there. Both of my parents had offices there when I grew up, and I remember doing homework while sitting on the floor against the wall under the huge blue whale. (Alas, it's gone, replaced by I think a humpback whale - it just isn't the same.) I spent most of the time in the Ascent of Man exhibit, also walked through the dinosaur hall (of course! ), mammals, and marine life. Then I stopped by the insect zoo - thirty years ago I was a volunteer for them. 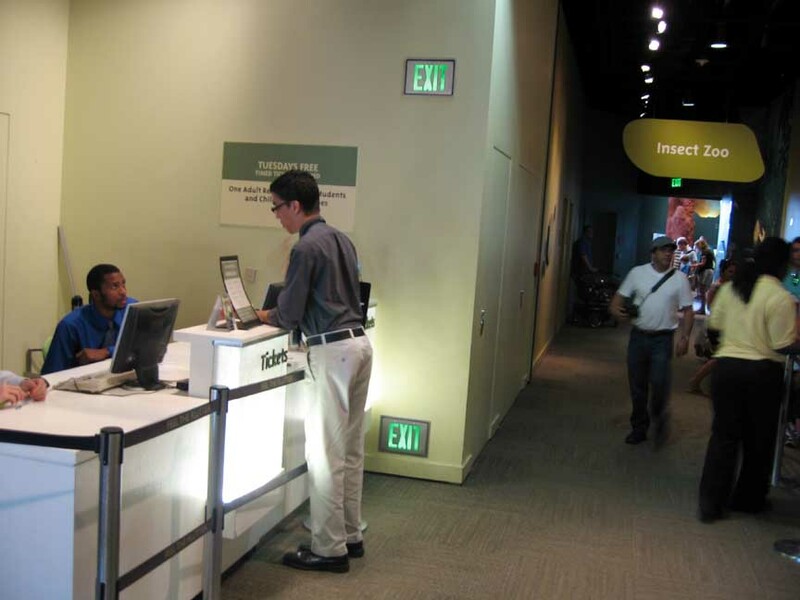 My dad's office used to be almost next door (he's an entomologist), but the entomology department had moved, and where my dad's desk used to be was now a ticket desk for the live Butterfly exhibit. Here's a picture. Alas, it was time to go home. Did I mention that by this time my back was killing me? I'm probably going to regret all this walking about when I next coach (tonight), but I guess my problems are rather minor compared to Shulim's.